According to colonial British historians and their Indian followers, Alexander’s campaign in India (actually West Punjab now in Pakistan) was one of the most important episodes in Indian history. The reasons given are two. First it allowed scholars to establish a chronological marker for Indian history by identifying Sandracottos of Greek records with Chandragupta the founder of the Maurya Empire. This made him a contemporary of Alexander whose dates are known from other sources. This equation, known the “Greek Synchronism“, is hailed as the sheet anchor of Indian history and chronology. All other dates are derived assuming it to be correct. No less importantly, Alexander’s ‘victory’ has been used as evidence of European superiority over Indians even in ancient times. This soon led to the claim that all Indian achievements from astronomy and mathematics to Sanskrit drama and epic poetry must have been borrowed from the Greeks. (like: Ramayana was a copy of the Iliad!) It is commonplace among Western Indologists to claim that all Indian science and mathematics were borrowed from the Greeks after Alexander. (If so why didn’t the Greeks have the decimal place value system for another thousand years, which they got from India?) Some even claim that Indian writing was borrowed from the Greeks. Anyone who questions this is immediately denounced as a chauvinist incapable of logic. The idea is fantastic. Alexander entered India in the winter of 327—326 BC and left when a mutiny of his soldiers forced him to retreat with heavy losses. As we shall see later his stay was brief and troubled. Philip, the satrap he left in charge of the garrisons was murdered by the locals and his garrisons swiftly overrun. Seleucus who tried to recover them was defeated and driven out. But to go by the accounts of colonial scholars, Alexander must have brought an army not of soldiers but scholars and scientists who taught Indians everything from writing to astronomy—all in a matter of months! Contrast this with the British experience. Their rule lasted two centuries, and at its height included all of India. And yet India retained its identity and knowledge, learning from the British of course but adapting them to Indian conditions. The Greeks were in control, if at all of a remote corner of India for a few months. How could they achieve so great a transformation in so short a time that the British couldn’t in centuries? But such questions are dismissed as chauvinistic and unworthy of debate. So it is best to leave these claims alone and look at what the records have to say. Before we examine these claims, especially Alexander’s supposed military success against the Indians a few facts should be kept in mind. No Greek records from the period survive; we know about them only from later, much later accounts that refer to them. This includes the Indica of Megasthenes which is only known from references in later works by writers like Strabo, Diodorus, Plutarch and a few others. And none of them mention the word Maurya. Several scholars have suggested that Sandrocottos of the Greek records could have been Samudragupta of the later Gupta dynasty. This would topple the Greek synchronism and place the Maurya dynasty including Chandragupta and Ashoka several centuries before Alexander. In contrast to the paucity of Greek records, we have ample records from Indian sources—Hindu, Buddhist and Jain—from the periods before and after Alexander. The most famous of these is the Arthashastra of Kautilya who was a contemporary of Chandragupta Maurya and hence of Alexander if his identification with Sandrakottos is correct. While they know nothing of Alexander, they do note invasions by others like the Scythians (Shaka), Huns (Huna), Persians (Parasika), Parthians (Prithu-Parthava) and others. The word “Yavana” (Yona in Prakrit) is fairly common in the late ancient age, but does not always mean the Greeks (or Ionians) much less Macedonians. The first identifiable reference to Alexander in an Indian work is found in Banabhatta’s Harshacarita written almost a thousand years after Alexander’s invasion. In this Bana refers to an Alikasundara and his campaign against a country ruled by women (stree-rajya) or “Amazons“. They are probably the same as the Massagetae whose warrior queen Tomyris defeated and killed the Persian emperor Cyrus the Great around 535 BC. Their country corresponds to modern Kazakhstan, so Alexander would have encountered them on his march towards Afghanistan (or Bactria). This suggests that the impact of Alexander’s march on India has been exaggerated out of all proportion to reality by historians of the colonial era. In order to get a truer picture it is necessary to have some idea of the historical and political background to Alexander’s campaign which was part of Macedonia’s expansionist policy and not just a bolt from the blue. Alexander was the son of King Philip II of Macedonia and Olympias, the fourth of Philip’s seven (or eight) wives. As Macedonians, they were looked down upon by the Greeks as half-barbarians. Probably to counter this, Philip engaged Aristotle to tutor Alexander in Greek learning. It was Philip who initiated an expansionist policy by invading and occupying Athens and other parts of Greece proper. To this end Philip introduced a military innovation known as the “phalanx“—a compact and disciplined infantry formation that could fight as a unit. This proved successful against the tribes of Asia Minor and Central Asia, as well as the once mighty but now disintegrating Persian Empire. These were pitched battles in which Alexander’s disciplined phalanxes proved superior. They proved less effective in India where he needed to move against large formations over vast areas. Philip was assassinated in 336 BC, plotted by Alexander’s mother Olympias according to some historians. Alexander III (to give his official name) inherited his father’s kingdom as well as the powerful army that he had created. He continued Philip’s policy of subduing the Greek states, which they intensely disliked, and expanded east and south until his forces were in Asia Minor (East Turkey). Egypt, which was chafing under Persian rule threw off its yoke and greeted Alexander as liberator. In 334 BC, he turned his attention to the wealthy but decaying Persian Empire. By 330 BC, Alexander found himself in Central Asia and Bactria (Afghanistan), trying to consolidate his hold over what were once parts of the Persian Empire. He was now near the border of India. He, like his contemporaries had heard a great deal about the country and its legendary wealth. Whether it was his love of plunder or imperial ambition that attracted him, he descended into the plains of Punjab in the winter of 327 BC. This shows that Alexander was not the first foreigner to take an interest in India. There were others—traders, mercenary soldiers and adventurers before and after Alexander. Some even set up kingdoms, or tried to until uprooted or assimilated into in the region of the northwest. They are referred to as the Indo-Greeks. They should be seen as part and parcel of long-standing encounters between India and the people to the west though most of them were not military in nature. We need to have some idea of this to get a truer picture of Alexander’s campaign and its impact. Links between India and the West, including the Mediterranean world of Greece, Ionia, Egypt and Rome is of untold antiquity. It is important to recognize that the ancient Greeks did not see themselves as Europeans, but as one with other people of the Mediterranean region that included Egypt, Babylonia and Persia. To them Europe and its people were barbarian. As previously observed, Alexander and his fellow Macedonians were seen by the Greek elite as barely a step removed from being barbarians. Other than a few questionable references in the Old Testament, the earliest Western work to mention India appears to be the Histories of Herodotus (c. 484—425 BC). His writings indicate that there were others before him who had visited India including possibly Pythagoras (c. 570—495 BC). It is not known if Herodotus himself was ever in India. His writings (or those ascribed to him) do not suggest any great familiarity with India of the time. But they do show that India and its people were already familiar to the Greeks centuries before Alexander. 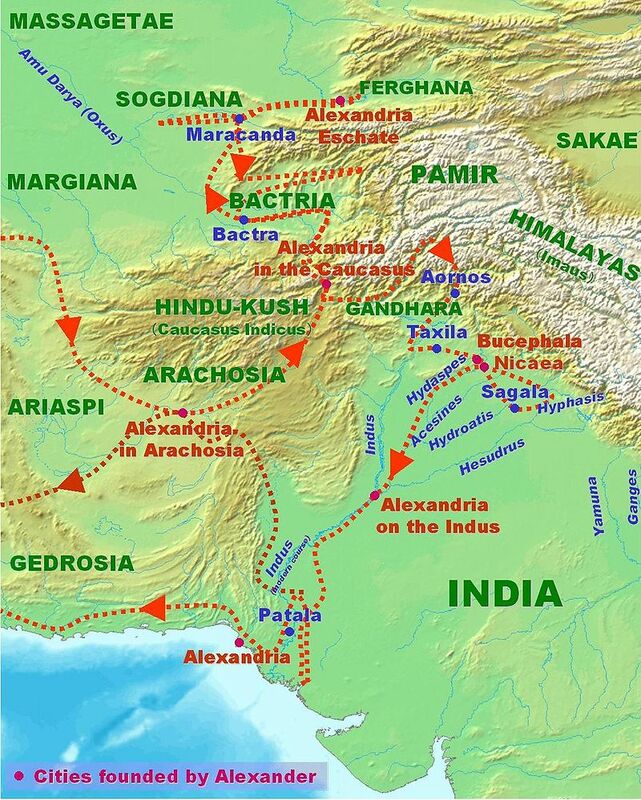 Until the campaigns of Alexander, there was no large-scale Greek presence in India though a few Greek colonies did exist in the northwestern regions of the subcontinent. Following his failure to gain a position in India and the defeat of his successor Seleucus Nikator, relationships between the Indians and the Greeks and the Romans later, was mainly through trade and diplomacy. Also the Greeks and other ancient peoples did not see themselves as in any way superior, only different. Herodotus in fact is full of admiration for Egyptians, Persians and the Ethiopians (Africans). The notion of Greeks as superior to Indians and other non-Europeans was a conceit introduced by Europeans of the colonial period. This historically realistic picture was first brought to light—to Indians at least—by the famous Russian general and military thinker Marshal Georgy Zhukov. In his convocation address delivered at the Indian Military Academy in Dehra Dun, Zhukov stated that Alexander’s conduct in the aftermath of his battle with Porus showed that he had suffered a catastrophic defeat. According to Zhukov, Alexander in his Indian campaign had fared far worse than Napoleon in Russia. A careful examination of Greek and Roman sources like Plutarch reinforces Zhukov’s analysis who was undoubtedly familiar with them. In particular it shows that his supposed victory over Porus was a later fabrication. Here is how Plutarch described Alexander’s “victory”: “This last combat with Porus took off the edge of the Macedonians’ courage and stayed their further progress in India…. Alexander not only offered to Porus to govern his own kingdom as satrap under himself but gave him also the additional territory of various independent tribes whom he had subdued.” So Porus emerged from his war with his territory doubled and his gold stock augmented. This can only mean that Alexander had to buy peace with Porus to ensure a safe passage for himself and his troops. How this constitutes victory is known only to colonial historians and their gullible Indian followers. » Dr. Navaratna Srinivasa Rajaram is a mathematician and historian who publishes with Voice of India.